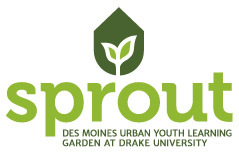 Sprout: The Des Moines Urban Youth Learning Garden at Drake University is located on the corner of Drake’s campus, and is a block away from the Boys and Girls Club of Central Iowa (BGCCI). Sprout serves as an environmental educational tool, urban gardening resource, and healthy food access point for students kindergarten through higher education. It features an outdoor classroom for 30 adults or 50 children, theme-based raised beds, fruit trees, native Iowa plants, and multilingual signage. Sprout is significant for the neighborhoods surrounding Drake because 97% of students K-12 qualify for free or reduced lunches. Additionally, Sprout is located in a food desert, so fresh fruit and produce from Sprout are important for the students in this neighborhood. Any student who learns or volunteers in the garden is able to take fresh produce home. The major strategic partner in the project is the Boys and Girls Club of Central Iowa. Two times a week students from various clubs plant, grow, and learn in the garden. This fosters interaction between Drake students, the BGCCI, and the surrounding community by bringing different groups of students together in the garden. For example, Drake students usually volunteer to help teach the environmental curriculum to the BGCCI students, which not only increases environmental learning for all parties, but also fosters a sense of community. Sprout was brought to life in the Summer of 2013 with the help of many community partners. We are excited to see where this growing season will take us!